This entry was posted in Bird Hunting, Gun Dog, Hunting, Upland Hunting. Bookmark the permalink. Farm raised birds? Dont take kill-photos behind farm raised birds. It’s disrespectful to those who hike for miles straight up mountains and come away with one (if any) precious bird. It’s about working with your dogs, not about shooting birds. Might as well go to the sporting clays course and pose behind a bunch of broken clays. You ignorance is a bright shiny light. You are right, it is about working with dogs, but how can any photo of dogs and birds disrespect a dunce like you? It most certainly is not about you. 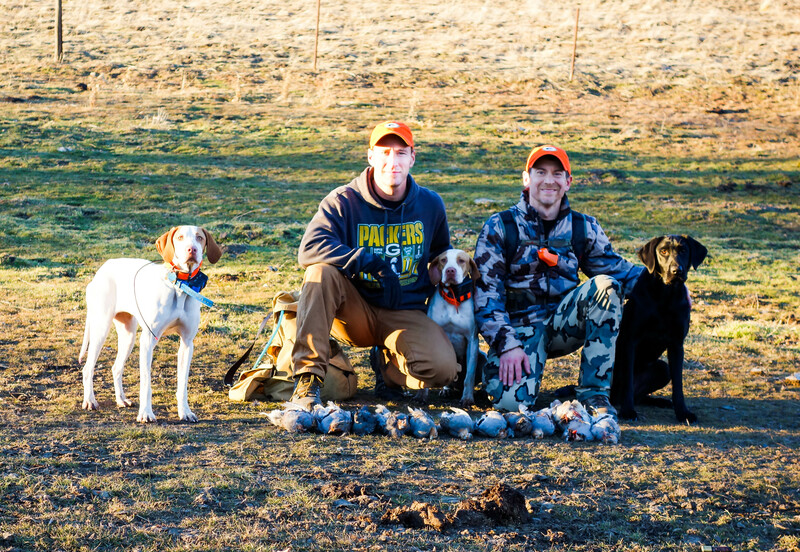 Those are bird dogs, bird hunters, and a great day of hunting recorded in a photo. Just push back from the keyboard and keep your ignorant comments to yourself. You self centered, preachy loser. These are wild birds, hunted in ferociously steep terrain. By asking a few polite questions to sucsessful people, you might learn how to come away with more than 0 to 1 bird per trip. You are correct, a large portion of the experience is about the dogs and yours deserves better. Check out those cool hats! Great day, great dog work and beautiful PUBLIC land.